The grey alpaca spins up beautifully and effortlessly. This is important because I have a lot to make if I want to knit a skirt. 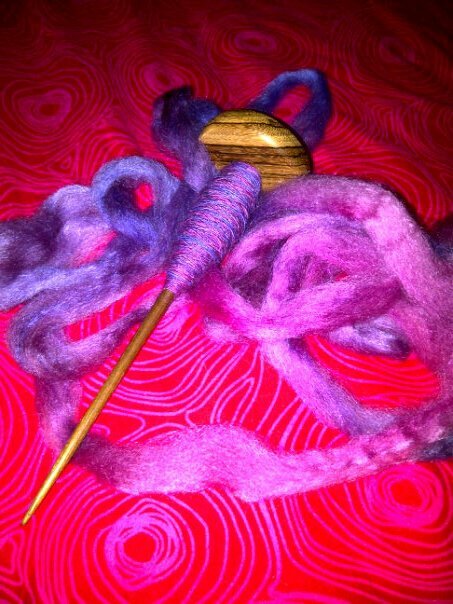 I spun this up on my Abby spindle, it’s a simple, inexpensive and highly effective spindle that Abby Franquemont offers as part of her materials in her classes. I like it because it’s light, fast and I don’t worry about busting it up in my travels. I take it with me where ever I go and spin when ever I have time (and energy). For my first sample, I spun it fine with a “Z” twist. That’s turning the spindle clockwise to spin. I made sure the fibres were locked, but I didn’t put a great deal of twist into it. My goal is a soft, but strong yarn to withstand the pressures of being a skirt. I can’t remember exactly how much I spun, but enough to make a good sized sample. My goal was to make a cabled yarn. That is a 4-ply yarn, so I needed a lot of yardage on this single. After I felt I had enough for the sample, I wound it off making a centre-pull ball, then I plied it, “S” twist – turning the spindle counter-clockwise. I put a lot of twist into the 2-ply, as much as it could handle. This is important when making a cabled yarn. This 2-ply yarn is going to be plied again. Yes, again. In the second ply, it is going to lose some of the twist so you need extra. I wound the 2-ply yarn onto my hand in the Andean style, making a bracelet so I could spin from both ends of the yarn. And I plied the 2-ply yarn with a “Z” twist. Cabled yarn has a lovely texture. The 2-plies lock against each other giving a purly texture. The resulting yarn was soft, still fine — which is surprising because it is a 4-ply yarn. The photos below show it. Not the best images I know. I am in a hotel room and I took the pictures with the camera on my phone. 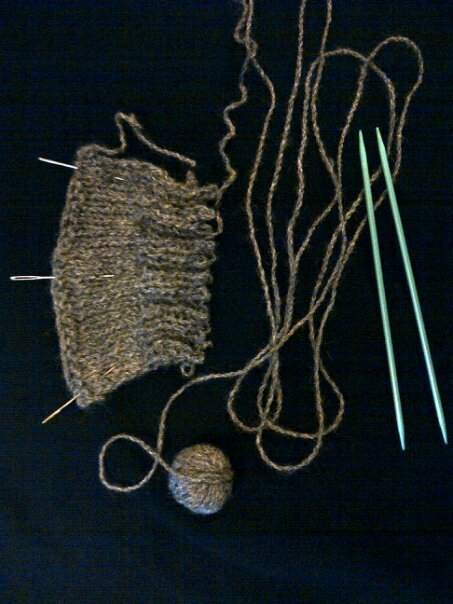 To gauge the thickness of the yarn, those needles are 3mm. The final sample yarn is 17 metres. Enough to knit up a good sized piece. I don’t want to make that kind of skirt. So onto sample #2. My plan is to introduce a single of tencel/silk, with a bit of colour. 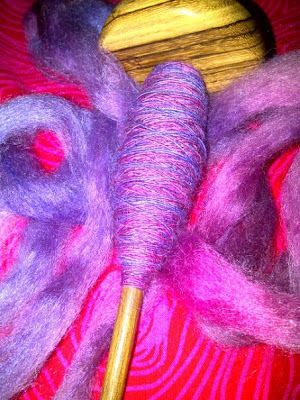 This entry was posted in Abby Franquemont, alpaca, drop spinning on November 4, 2011 by DianaTwiss. Mark your calendars and join us on Saturday, November 5h, 10am – 5pm and Sunday, November 6th, 10am – 4pm for the Langley Weavers’ and Spinners’ Guild annual Artisans’ Sale: Beyond Fibre. This is a sale for those of you looking for unique, one-of-a-kind items or gifts. Located at the Community Hall in the quaint historic town of Fort Langley, the Artisans’ Sale: Beyond Fibre features the juried woven, knitted and felted works of the Weavers’ and Spinners’ Guild and several other local artisans. Some of the artisans include jewelers, potters, photographers, wood turners, soap makers, card makers. You will find hand crafted silk flowers, origami cards and sheep skin slippers. This is more than a sale, it is a fibre event, for there is a Wool Room featuring the wares of our guild vendors selling fibre arts materials, supplies and equipment. Relax downstairs in our Tea Room with a warm cup of something and a delicious snack – observing our display of handcrafted socks. There will be door prizes and a silent auction. For more information and to see photographs of previous years, please visit our website. This entry was posted in drop spinning, Sweet Georgia Yarns on November 4, 2011 by DianaTwiss.